A day at the beach … or as close as you can to the beach in Arkansas = Stephanie’s Pool! We all got the text early Saturday morning – “Open invite to come to Steph’s pool – BYOB – noon on…” or, as it was in our case until huge and threatening thunderheads roll in! It was a great and relaxing afternoon. Stella brough Lindsey and Jason to play too! Stella is such a fish – she has no fear – watch out Mommy! I taught “Mommy and Me” swim lessons for about 8 years and it was so much fun to be back in the water with a brave little girl – that truly was one of the most rewarding jobs I’ve ever had – anyone need private swimming lessons? 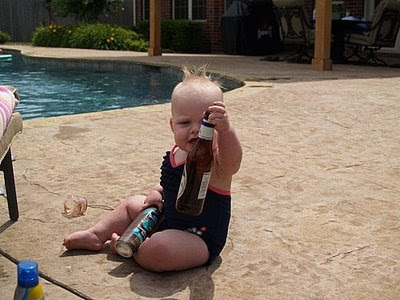 Of course, what’s a pool party with out a beer, Stella even knows this. We all had a great time and can’t wait to do it again soon! Thanks Stephanie!